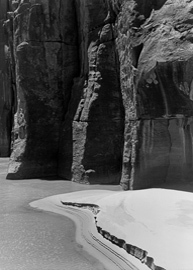 Whirlpool Canyon, Echo Park, Dinosaur National Monument, Utah-Colorado, 1951, by Philip Hyde. At another overlook an unimproved trail winds out to the canyon rim. Cholla Cactus wedges between parted layers of lichen-covered sandstone. Skunkweed and sage hold to small troughs of soil. To the right the cliff drops a dizzying 1,500 feet straight down to the steep slopes dotted with the green of stunted Douglas Fir and Juniper that run down to the edge of the inner gorge of bare rocks and wind-swept stone domes. Lichen varies from black to gray to burnt orange, yellow-green, gray-green and many combinations, matching the layers of sandstone. Robins and a Chickadee call softly. Back from the cliff edge the gray twisted wood of dead Junipers and Pinon Pines shelters Rudbeckia, a tall yellow star-shaped flower. Today Dinosaur remains one of the least developed National Monuments in the country. Most of the roads are still unpaved and few are graded and graveled. Following the plateau skirting the canyons, on 26 miles of part dirt and part pavement, between monument headquarters and the Echo Park turnoff, the weather changes four or five times. At one moment the white puffy clouds with plenty of blue sky between look harmless. In the next moment after topping the plateau, a low, dark bank of clouds approaches. It is hard to tell at what speed the clouds are approaching, when they will arrive, how soon they might produce rain, or whether they are headed toward the Echo Park road that cuts steeply down through long, precipitous alluvial slopes and sandstone cliffs. In dry weather, the hardened mud-slide road is more visible and easily examined from the turnoff as it descends. The beginning of the route consists of mostly gravel and seems easily passable, perhaps even in rain. The roughest, most rutted part of the road is deceptively out of sight and turns to clay as slippery as axel grease when wet. In the space of 15 minutes the sky shifts and changes several times from threatening to clearing. Before a rain any two-wheel-drive car could make it down the 13 miles, but not back up—rain could trap an unfortunate sojourner in Echo Park for days. In 1950 Richard Leonard served both on the Sierra Club Board and as a leader of the Wilderness Society. Olaus Murie and Margaret Murie were also Wilderness Society leaders. After a meeting of Wilderness Society leaders in Denver, Richard Leonard, Olaus Murie his wife Margaret Murie visited Dinosaur National Monument. They made it out of Echo Park without incident and they were greatly impressed by its scenery. The next year when Richard Leonard and Sierra Club Executive Director David Brower sent my father, landscape photographer Philip Hyde on assignment to Dinosaur National Monument, Dad almost did not make it out of Echo Park. 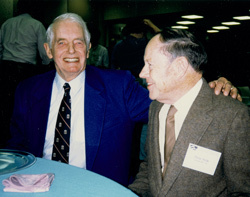 “That was the beginning of a very long association with Dave of making books and working with the Sierra Club too.” Dad made sure he did not work “for” the Sierra Club. He was a freelancer on assignment. “They managed to scrape together small amounts of cash and I would go off on a project.” Dad said. 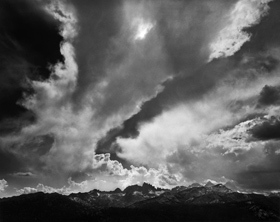 “In the case of my first trip in July l950, Dave invited me to accompany the 6 week High Trip, which looking back now was very important for me to do.” Following the High Trip, a signature, or series, of Dad’s photographs graced the pages of the Sierra Club Bulletin. It was Dad’s first publication and was widely acclaimed. 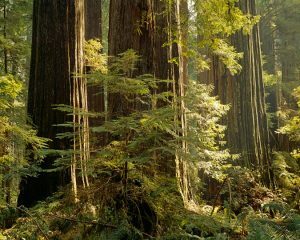 That paved the path for David Brower to suggest to the Sierra Club Board that Dad go to Dinosaur and bring back some of the beauty. On assignment from the Sierra Club in June 1951, Dad had difficulty making it out of Echo Park even in dry weather. Dad said that when he and my mother, Ardis Hyde, tried to climb the steep hill out of Echo Park in their 1949 Studebaker Champion, they could not make it up the steep section above the inner canyon. “We had a lot of camping gear, food, photography equipment and God knows what else,” Dad said. “Champion was notoriously underpowered. I got up as far as I could and unloaded the car partially. We took what was left on up to where the road leveled off a bit. Ardis stood by the upper half of the load while I went back for the rest. That was the kind of thing you had to be prepared to do in that country because there isn’t any help out there.” Ardis and Philip Hyde worked as a team and Mom never balked at any challenge nature presented. At Dad’s picture stops, Mom slipped right out into the deep grasses or onto the steep hillsides, observing and identifying all she saw. She was a keen birder and a self-trained botanist. Dad and Mom drove from their home in Greenville in the Sierra Nevada Mountains of northeastern California about 850 miles to Dinosaur National Monument with only a verbal request from the Sierra Club and a promise to pay Dad’s expenses plus one dollar per print or published landscape photograph. He was not long out of photography school at the California School of Fine Arts where he studied under Ansel Adams, Minor White and Edward Weston, with guest lecturers including Imogen Cunningham, Dorothea Lange, Lisette Model and other photography greats from 1946 to 1950. Philip Hyde joined the Sierra Club in 1946, a year before his marriage. Ardis Hyde joined the Sierra Club the year she married Dad. They were married four years when she accompanied him on this, his first photographic assignment to the dry Colorado Plateau. The young couple had become acquainted while attending the University of California Berkeley and found they had much in common including a shared passion for nature. Both of them grew up camping under the stars, Philip in the Boy Scouts and with his family; Ardis with her family, her father especially loved the outdoors. Later, the couple imparted that love to me, their only son. 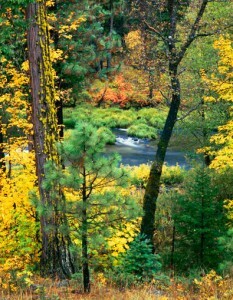 Dad’s wilderness photographs in time would appear in more environmental campaigns than any other landscape photographer. Dinosaur was the first major campaign, and to this day Dad’s image of Steamboat Rock is one of his most published. “That photograph became a symbol of the fight to save Dinosaur National Monument,” Dad explained. 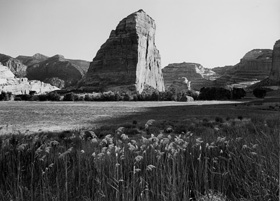 “Steamboat Rock was the symbol representing Dinosaur long before I photographed it.” Dad made his photograph from the end of Echo Park where the road enters, near the cliff across the field and opposite Steamboat Rock, probably not far from the old cabin, where the night Ranger now stays. Today, the field is home to at least one four-foot long rattlesnake. I saw the distinctive diamond-shaped skin pattern and rattles as the snake slithered away when I was stalking Dad’s picture site. He made the photograph with his 5X7 Deardorf View Camera. He framed the picture with some of the waist-high grasses in the foreground and the dry desert grasses only an inch or two long stretched away toward the Cottonwood-lined river and the 800 foot tall Steamboat Rock looming over it all. As with his later landscape masterpieces, Dad’s use of foreground detail invites the viewer to all but step into the photograph. At the upstream end of Echo Park the Yampa River joins the Green River just out of sight on the far side of Steamboat Rock. On the near side of the giant monolith, the narrow 1,000 foot deep gorge opens into Echo Park, essentially a small valley lush with cottonwoods, willows, native grasses and wildlife. Off to the left of the road at the downstream end of the valley lies a small 17-site campground with running water. A gravel road leads down to the river for float trip access. At the water’s edge Steamboat Rock dominates the view. Its hulking nearly 800 foot tall mass of vertical sandstone rises directly out of the far side of the swirling waters of the Green. The swollen river slows, reflecting glimpses of red sandstone and shattering the images as the torrent churns again naturally free and unfettered. From the boat landing the proposed dam site is almost visible just out of sight where the river dives back between narrow sheer walls that could make dam construction easy. The boat landing would have been buried under 500 feet of water. Echo Park potentially could have become the ideal water storage tank, though its scenery would be destroyed, not enhanced as the Bureau of Reclamation claimed. Only the top 300 feet of Steamboat Rock would have shown and the sense of the size and grandeur of the formation would have vanished. With the monolith dwarfed, visitors today would be left with the reek of motorboat gasoline and a cesspool of settling mud and evaporating water. Some of the most beautiful scenery in the entire region would have been inundated along with Echo Park. The road into Echo Park through Sand Canyon, along shady Pool Creek and the Pool Creek Petroglyphs, would all have been flooded. In Sand Canyon the sandstone forms into cake-layered tan-gray rock terraces. Over the terraces and alternating rounded and undercut layers, the black lichen stains run vertically where water seeps. In the horizontal ledges Junipers cling to pockets of earth. 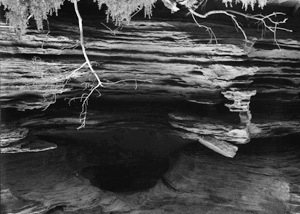 At intervals the soft underlayers cut far under harder layers to form overhangs and caves. A few of these have collapsed or partially collapsed roofs forming the beginnings of future arches. All of this would have been lost. Dinosaur National Monument contains 200,000 acres, predominately canyons. Most of the canyons would have been flooded with the dams in place, virtually eliminating the primary scenic feature. The two proposed dams, at Split Mountain and at Echo Park, would have inundated about 91 out of 101 river miles in the monument, Sue Walter explains in her Ranger talk at Dinosaur National Monument Headquarters. She reminds the listener that the Bureau of Reclamation did have a dam built upstream from Dinosaur’s northern boundary, on the Wyoming border at Flaming Gorge, but the Yampa River remains the only undammed tributary to the Colorado River system. Because of this the Yampa River is the only surviving habitat for four endangered fish species: the Humpback Chub, Razorback Sucker, Colorado River Squawfish and Bonytail Chub. Dams stop the flooding that maintains natural flora and fauna and creates backwaters for spawning. 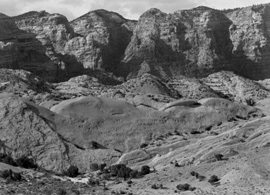 Wishing to photograph some of the wildest parts of the Yampa River and Green River, Ardis and Philip Hyde explored the Dinosaur National Monument canyons the whole month of June, 1951. In a letter from the field to Richard Leonard, Secretary on the Sierra Club Board of Directors, Dad wrote, “At Mantle’s Ranch we wandered for eight days and left feeling like we’d only scratched the surface.” Mantle’s Ranch is in Castle Park, another verdant opening of the canyon into valley, upstream from Echo Park. The Mantles were early homesteaders before the monument. Into Mantle’s Ranch Mom and Dad followed a landscape architect in a jeep, who was investigating possible campground sites and other potential improvements for the Park Service. Fortunately a Park Ranger followed along behind them in a green Charger.